Expo Line Approval: License to Kill? The L.A. Country Metropolitan Transportation Authority and its Exposition Light Rail Construction Authority with their army of lawyers, consultants, lobbyists and PR agencies, which are all paid from our tax money, are vigorously pushing and asking for CPUC approval of their at-grade crossings near the two schools. 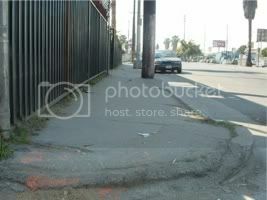 However, the local community organizations and the Los Angeles Unified School District are opposing such at-grade design of intersections. The public’s distrust of MTA is rooted in its dismal safety record. Ninety people have died on the MTA’s 22-mile L.A.-Long Beach Blue Line, which has had more than 821 recorded incidents since its inception in July 1990 to July 2008. These numbers, which are significantly higher than national average rates of accidents and fatalities along the MTA rail network, attest to the dire state of rail safety in LA, which is primarily caused by MTA’s outdated and messy safety-related policies, procedures and practices. If the CPUC has not learned its lessons about the human factors-related root-causes of past rail accidents, and does not fully scrutinize MTA’s proposed crossings’ risk and hazard analyses, then CPUC’s “easy” approval will be tantamount to granting MTA and its Expo Line Construction Authority a license to kill and maim school children and adults on the Expo Line for the next decades to come, as approximately 72 million Dorsey students who will use the Farmdale Avenue crossing during the expect life of operation of this line. The CPUC’s approval would provide MTA with the alibi – the “design immunity” in legalese – for so doing. Expo Line Approval: A License to Kill? The Metrolink crash in Chatsworth on Sept. 12, which killed 25 and injured more than 135 innocent people, highlighted the need for much more rigorous government scrutiny of rail safety in the country and especially in Southern California. It is against this sober backdrop that we — the badly hit Southlanders — are pleading and looking up to the north for a protector from future rail carnages. This Thursday, Jan. 29. the five commissioners of the California Public Utilities Commission are expected to vote on and announce their final decision concerning the design of key street crossings in phase 1 of the Exposition Light Rail, or Expo Line, project planned from downtown Los Angeles to Culver City. It will cross major busy city streets such as Vermont, Western, Farmdale and Crenshaw. There are rare occasions that a San Francisco-based state agency’s decision can determine the risk to life and safety of millions school children in Los Angeles for the next 75 to 100 years. However, this CPUC’s decision will be a precedent-setting case and there certainly will be future similar cases elsewhere in California, and as such, many more lives will be at risk. In fact, the term “light rail” is a bit of a misnomer. Each of the three-coupled 225-ton train cars will operate at speeds of up to 55 miles per hour. Expo Line trains will run every 2 to 2.5 minutes, 22 hours a day, in opposite directions on parallel sets of dual tracks and will cross Farmdale Avenue at street level (at-grade), within 10 feet of Dorsey High School, which has 2,100 students, and will cross Western Avenue and Harvard Blvd., also at street level, within 50 feet of the Foshay Learning Center, which is a K-12 Multi-Track School with 3,400 students. Moreover, the automatic “design immunity” entitlement of MTA has also been responsible for the status quo, as well as stifling any motivation and imputes within this agency for any fundamental change and systematic safety improvement. Neither numerous deaths and the resulting protracted litigations, nor trail or appeal court’s affirmative rulings against MTA in favor of the rail accident’s victim (plaintiff), have been able to make a dent in the MTA’s dismal safety practices. This time around, the CPUC approval of MTA’s requests for the Expo Line would do the same. It will not only continue to shield MTA’s unsafe crossings and operation against any future lawsuits stemming from accidents and resultant injuries and deaths caused by design-induced errors of pedestrians and drivers on the Expo Line, but also will further hardened MTA’s entrenched archaic safety culture. It is truly perplexing that the Exposition Light Rail Construction Authority, even in this dismal state economy, is still continuing to squander millions of dollars of precious taxpayers’ money by lavishly paying for thousands of pages of legal briefs, stubbornly fighting neighborhood community organizations, and recklessly disparaging scientific facts which justifiably question and refute its proposed designs. This is the money that should have been spent on making the Expo Line safer and our hope is that the CPUC puts an end to this vicious cycle. The CPUC of today has much greater competent technical resources and it can (and should) learn from other agencies such as the National Transportation Safety Board and do much better job than what it did some 30 years ago and consequently we are stuck with the Blue Line’s unsafe intersections. We can only hope that what the American philosopher William James said, “great emergencies and crises show us how much greater our vital resources are than we had supposed,” also applies to California and its PUC. Najmedin Meshkati is a professor at the Sonny Astani Department of Civil/Environmental and a professor at the Daniel J. Epstein Department of Industrial & Systems Engineering (ISE) at the Viterbi School of Engineering, University of Southern California. He teaches and conducts research on the safety of technological systems and created USC’s Transportation Safety Program in 1992. Robert “BJ” Takushi, a recent graduate of the Epstein ISE Department, received a grant from the Rose Hill Foundation to study the Expo Light Rail safety. The MTA/Expo Authority and our elected officials claim they’re building an Expo Line that will have a safety record more like the Pasadena Gold Line, which is far from what most reasonable people consider “safe,” but less deadly than the Blue Line (the deadliest light rail line in the country). Their statements would be laughable if the consequences – failing to address serious safety hazards – were not so severe. In fact, in July of 2007, Fix Expo sent a letter to MTA/Expo Authority executive Rick Thorpe, essentially requesting he admit the differences, and he remarkably refused to answer our questions. In his prepared testimony before the California Public Utilities Commission, Professor Najmedin Meshkati, an internationally renowned expert in human factors in complex technological system failures and the creator of the USC’s Transportation System Safety Program, identified the following six differences between MTA’s proposed Expo Line, and existing Pasadena Gold Line and Blue Line in explaining why the Blue Line is a far more appropriate comparison to the risks and hazards that will be present on the Expo Line. The following are extrapolations of his six bullet points. 1. Almost all streets with high vehicular cross-traffic volume are grade separated on the Pasadena Gold Line (“PGL”), while streets with comparably high vehicular cross-traffic volume on the Expo Line are at-grade. Only the Colorado Blvd and Lake Avenue crossings on the PGL have high vehicular cross-traffic volume comparable to the Expo Line crossings at Adams/Flower, Vermont/Exposition, Western/Exposition and Crenshaw/Exposition. Yet, both Colorado Blvd and Lake Avenue are grade separated, while Adams, Vermont, Western and Crenshaw along with many other crossings with high vehicular cross-traffic volumes along the Expo Line are street level (at-grade) without even basic crossing gates. In fact, few cross streets have vehicular cross-traffic volumes as high as the above Expo Line crossings on even the Blue Line, yet accidents and deaths still frequently occur at the intersections. 2. Several long portions of the PGL are fully grade separated, while the overwhelming majority of the Expo Line from Downtown LA to Hauser Blvd is at-grade, like the Blue Line. There are 41 grade separations on the PGL including a 3.7-mile portion where the train operates completely grade separated in the median of the I-210 freeway, like the MTA’s Green Line, a light rail line designed 100% grade separated (crosses no street). Indeed, after the PGL departs Union Station it travels over 2.5-miles on grade separated tracks (elevated and fenced off street-level tracks) before it reaches its first at-grade crossing at Avenue 33. In other long portions, like the 1.5 miles between Ave 36 & Ave 50, there is only one crossing. 3. The Expo Line at-grade stations are expected to serve large numbers of riders like the Blue Line at-grade stations, not like the low-ridership Pasadena Gold Line at-grade stations. The additional pedestrians not only present more potential victims, they create more challenges, elements, obstacles and distractions when trying to safely drive, walk, and cycle around the stations to all pedestrians, motorists, and train operators. Coupled with the already tightly-wound and overburdened traffic system, unexpected pedestrian movements, such as slower crossing speed due to age and/or disability, or walking against the no-walk sign make the Expo Line crossings more complex and more likely to lead to accidents. High ridership can be expected to be a factor in Expo Line accidents and fatalities as well. 4. The anticipated pedestrian activity around Expo Line crossings is expected to be high like the Blue Line crossings, not like the overwhelming majority of Pasadena Gold Line crossings, which have substantially lower pedestrian activity. Limited sidewalk capacity leads to more risk taking behavior, like walking in the street to walk around crowds, or pedestrian spillover into the streets due to walk cycles that aren’t long enough to accommodate the pedestrian surges. High pedestrian activity around the Expo Line can be expected to be a factor in Expo Line accidents and fatalities as well. 5. 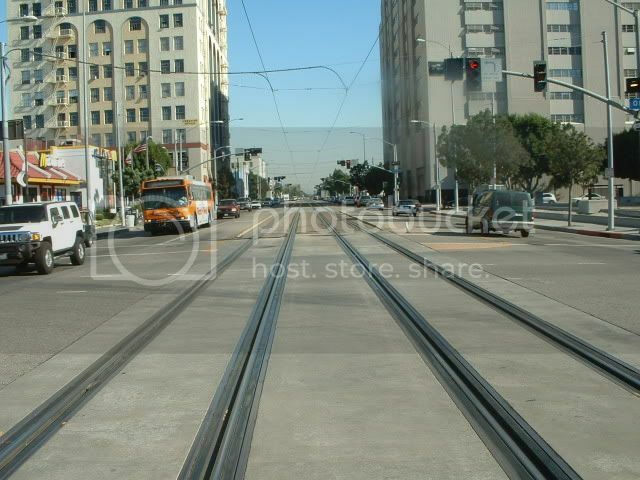 The PGL crosses no high vehicular cross-traffic volume intersection in street-running design, while comparatively the Expo Line crosses several high traffic volume intersections in street-running design, like the Blue Line. 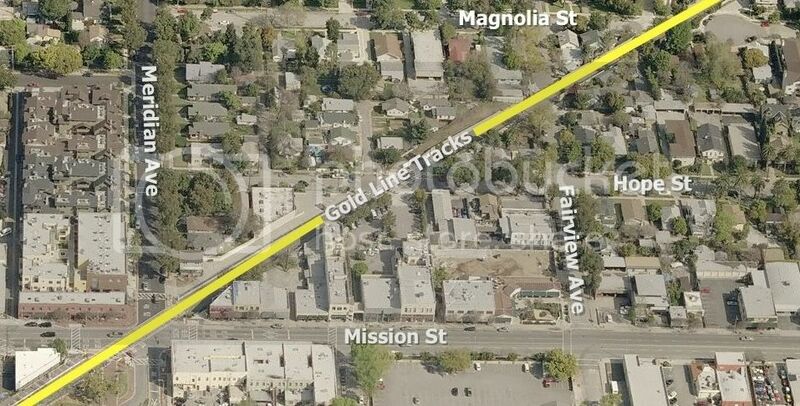 Of the 13.7 miles of track on the Pasadena Gold Line, only the ¾-mile section on Marmion Way in Highland Park from Avenue 51 to Avenue 57 operates in “street-running design” (the train operates without crossing gates directly parallel to vehicular traffic). This amounts to only 5% of the entire track. And in the Highland Park section, the parallel and cross street traffic is very low, as Marmion Way and the cross streets are 2-lane residential streets. In fact, the speed of the trains is limited to 20 mph and traffic in all four directions is stopped when the train crosses an intersection. Yet, despite these low traffic volumes, slow train speeds and four-way red light, 40 – 45% of the MTA’s recorded accidents along the 13.7 mile PGL have occurred in this ¾-mile section, the only portion of the track without grade separation or crossing gates. Comparatively, roughly 3.4 miles of the 8.6 mile Expo Line alignment (40%) is in street-running design, where the train is proposed to operate without crossing gates, travel at 35 mph with parallel lanes of high volumes traffic on Exposition Blvd and Flower Street, and cross streets with high volumes of traffic (Washington/Flower, Adams/Flower, Jefferson/Flower, Vermont/Exposition, Normandie/Exposition, Western/Exposition, and Crenshaw/Exposition). This operation is comparable to the sections of the Blue Line on Flower Street and Washington Blvd in the City of Los Angeles (see below), and to a lesser degree to the City of Long Beach section south of the Willow Station. Indeed the Expo Line will operate on the same tracks as the Blue Line on the Flower Street side alignment tracks from 7th Street Metro station to Washington Blvd, where the 0.6-mile at-grade portion from 12th Street to Washington Blvd has resulted in 154 accidents in 18 years of operation, an average of 9 accidents per year over just 0.6-mile. This is the most accident-prone section of light rail in the country. According to MTA’s March 2008 Summary of Blue Line accidents, 56% of all the recorded 647 train-vehicular accidents with the Blue Line and 47% of the total 813 accidents with the Blue Line, have occurred on Flower Street and Washington Blvd street-running segment despite the fact that it accounts for only 11% of the total tracks (2.5 miles out of the Blue Lines 22 miles of track). When adding the street-running segment in Long Beach, which has some differences, but more similarities with the Washington Blvd and Flower Street street-running segments, 92% of all vehicular accidents and 76% of the total accidents on the Blue Line occur in the street-running segments, despite the fact that it accounts for only 25% of the total tracks (5.6 miles out of 22 miles of track). Additionally, because the Blue Line crosses several high capacity north-south streets in its Washington Blvd street-running section, north-south traffic is more dispersed, as opposed to funneled into one major arterial street. Comparatively, on the Expo Line the closure of several nearby crossings within a short radius of the major intersections, particularly around Western/Exposition, Normandie/Exposition and Vermont/Exposition, and the elimination of left-turns and U-turns at other streets, will divert more of the area’s traffic to already congested and problematic intersections resulting in more driver delay, and thereby driver frustration, which leads to more risk-taking behavior. Driver frustration from increased traffic can be expected to be a factor in Expo Line accidents and fatalities as well. 6. 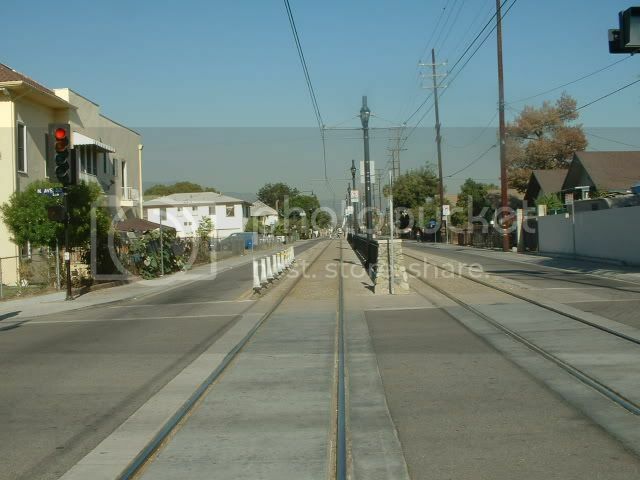 The PGL operates almost entirely on an isolated right-of-way, while almost the entire Expo Line alignment is directly parallel to vehicular traffic like the Blue Line, including several sections in street medians and side alignment. The PGL operates almost entirely on an isolated right-of-way with crossing geometry that is very different than the Expo Line crossings. As explained above in #5, the PGL has no comparable street-running section or side street-running section like the Expo Line. Comparatively, there are sections of the Blue Line with similar crossing geometry and mitigation measures as proposed on the Expo Line. The close proximity of contra-flow and parallel vehicular traffic movements relative to the entire Expo Line right-of-way provides very limited room for recognition, response and recovery for miscalculations, or alterations to unexpected movements of road-sharing motorists, pedestrians and cyclists, or even train operators. 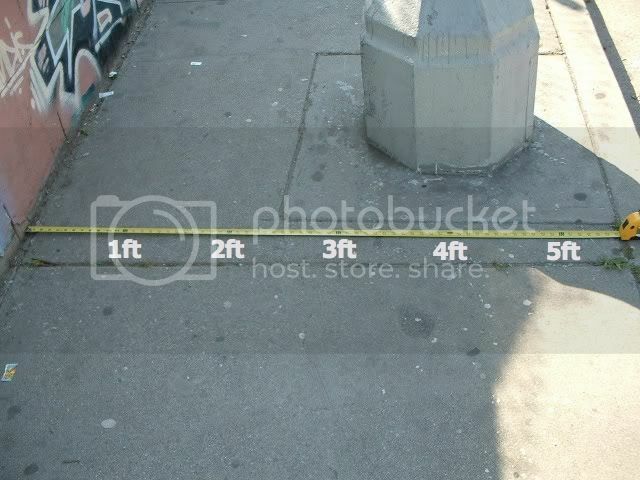 The limited margin for error can be expected to be a factor in Expo Line accidents and fatalities. The behavioral, social and environmental characteristics along the Expo Line corridor individually and collectively make the Pasadena Gold Line an inappropriate comparison, and the Blue Line a more fitting comparison. The PGL can only be considered comparable and thereby a good barometer for judging Expo Line crossing safety hazards if one ignores: train speeds, track alignment, crossing geometry, volume of vehicular traffic, volume of pedestrian traffic, roadway infrastructure, sidewalk capacity, and the environment in which the train operates – basically almost all of the elements that every rail safety expert and rail accident investigator considers when evaluating grade crossing hazards or attempts to identify the leading contributors to train accidents and deaths. In the MTA’s own 1998 Booz-Allen Hamilton study, which asked, “What makes the Blue Line the deadliest light rail line in the country?” the MTA identified factors that are behavioral, social and environmental around the system and crossings as the cause. And yet, in their PGL comparison, the MTA/Expo Authority has provided no information about any of these important elements around the PGL, because they are not analogous to the Expo Line. This is the major flaw – the Achilles’ heal, of the Expo Authority/MTA’s assertion that the Expo Line won’t be as deadly and accident-prone as the Blue Line and will have a safety record more like the Pasadena Gold Line. At the CPUC evidentiary hearing at the crossings near Dorsey High School (Farmdale) and Foshay Learning Center (Western), Russ Quimby, an internationally renowned rail safety expert testified on our behalf. The 1974 West Point graduate spoke about his integrity, his qualifications and background after spending 22 years at the National Transportation Safety Board (”NTSB”) as the Investigator-in-Charge or Chair of rail and rail transit accidents Investigation Groups. Quimby testified about NTSB studies, which determined that slowing down the trains “creat[es] as many problems as you solve,” how the Metro policy used to determine whether crossings qualify for grade separations “cannot seriously be described as a safety policy,” how the Western Ave crossing right next to Foshay, has “‘no time’ for safety,” as mentioned below, how the Farmdale crossing creates a notable risk of catastrophic accidents, and how the crossings near the school are not safe. From July 2007 to May 2008, I was Asst. V.P. for Operations, Planning & Analysis at Rail Sciences Inc., where I served as an expert witness in legal cases, conducted risk assessments of railroad operations, training, track, and equipment, and investigated rail related accidents. From 1985 to 2007, I was a safety engineer and investigator with the National Transportation Safety Board (NTSB). While with the NTSB, I was the Investigator-In-Charge and/or Chairman of the Mechanical, Track, or Operations Investigation Groups for all severity levels of railroad or rail-transit incidents, accidents, and disasters. I conducted investigations, wrote and prepared factual and analytical reports for public record, examined witnesses at public hearings and depositions, and supervised simulations and equipment test by carriers, vendors, and manufacturers. I participated in 57 major accident investigations, 32 field accident investigations, 10 public hearings, 16 depositions, and 6 special studies. I personally wrote 11 major accident reports for publication, 8 field accident reports, and I conducted 10 sworn depositions proceedings. I was also the originator or major collaborator for over 157 NTSB adopted recommendations. In my opinion, the proposed at-grade crossing at Farmdale Avenue is not safe because it poses an unreasonably high safety risk to the students at Dorsey High School. First, that a train will collide with a vehicle with sufficient force to either derail the train into and/or push the vehicle into the proposed ‘holding pens’ where several hundred students are trapped inside, killing or seriously injuring scores of students in a single accident. Second, that a train will collide with a vehicle (particularly a truck or bus) rupturing and igniting a fuel tank which would engulf students in the holding pen in flaming diesel or gasoline. Third, a combination of the above two scenarios where the students are crushed and burned simultaneously by vehicles and/or a derailed train. This crossing lacks any safety margin for failure in human behavior. The timing is so precisely choreographed and tight that there was no time left in the design for the activation and movement of gates, so they were eliminated. This, in itself, tells me that this intersection has ‘no time’ for safety. Any number of likely scenarios could trigger a delay in the crossing sequence resulting in an accident at the crossing, either separately or by interaction between vehicles and pedestrians, resulting in serious injury or fatality. Metro’s Grade Crossing Policy is not a safety-based policy. In fact, as far as I can tell from [Expo Construction Authority CEO] Mr. [Rick] Thorpe’s testimony, the policy has nothing whatsoever to do with safety and is concerned almost entirely with Metro’s operational convenience regardless of safety concerns. The policy cannot seriously be described as a safety policy because traffic volume and train frequency alone tell you very little about the safety of a rail crossing, particularly when traffic volume is reported on a per lane basis. As far as Metro’s Grade Crossing Policy is concerned, for purposes of grade classification, a crossing that intersects a single lane street going in one direction with no pedestrian traffic is analyzed identically to a crossing that intersects twelve lanes going in six directions with peak pedestrian traffic in the thousands per hour. As long as train headways and per lane traffic volumes fall within acceptable standards, a crossing will be designed at-grade with no need for further review or analysis. The Metro Grade Crossing Policy is a logical operational policy from a rail perspective, but it does not nor should not replace a responsible, comprehensive system safety analysis, which should include a human performance study. The risky designs of these two proposed crossings illustrates the point that factors beyond train frequency and vehicle traffic must be taken into consideration to create designs that are reasonably safe for the public – and particularly for children. If the proposed crossings at Western Ave. and Farmdale Avenue do not qualify for grade separation from a safety perspective, then no crossings would. I also gave [UCA/Fix Expo] a warning that after I reviewed the material, I may give them an opinion they might not like. [….] I emphasize the fact when I got into this business, I won’t trade my integrity for money. And what happens is if you slow the trains down, your window of hazard lengthens. And then you get the condition, the population to believe, well, the train is slow. It’s hard to judge a train coming head on at you with a headlight on. And that basically causes the students, emboldens them to basically say, well, the train is only going ten miles an hour, I can beat it, and run across the tracks in front of the trains. I guess in [National Transportation] Safety Board studies that we’ve done you end up creating as many problems as you solve by slowing the train down. You just create a longer window of opportunity or hazard. And your statement that the students would be embolden to run across the tracks, what do you base that on? Well, they’re going very slow, and you got students who are impatient and standing there waiting for a slower train to go by, and they feel like they have more time to beat the train across the tracks. What about gates that go down, wouldn’t that? With pedestrians in particular, a lot of people feel, even if you have pedestrian gates there, they duck under them, walk under them, whatever. People ignore signs and gates. 25 percent of all vehicle collisions at grade crossings that had gates result in fatalities. I mean so if you’ve got 25 percent of the people being killed at crossings with gates, you know, they drive around them and things of that nature. So a gate is like – it’s more – obviously more active than a sign, but it doesn’t prevent behavior. Well, informing that opinion, wouldn’t it have been useful for you to observe whether or not that’s the case on other lines within Los Angeles? I saw that at the Vernon Station. You observed people crossing with the same sort of crossing barrier? And often, right, just all the time racing across? And you translate that opinion back to the same thing is going to happen at Farmdale? I would say most certainly. And it happens generally. I’m not a behavioral scientist, but generally speaking, the younger the population, the younger the person, generally the more apt they are to do that, because they’re physically able to. And I don’t know, when you’re young you don’t have the rationale and experience as you do as you get older where you’re more careful. According to the Federal Railroad Administration, 74 people have died in Metrolink crashes since 1999 in California, out of which 20 have been killed in grade-crossing accidents. Ninety people have died on the MTA’s 22-mile L.A.-to-Long Beach Blue Line, which has had more than 821 recorded incidents between its inception in July 1990 and last July. The above-mentioned, significantly higher-than-national average rates of accidents and fatalities along the Metrolink and MTA rail network attest to the dire state of rail safety, which is primarily caused by outdated and messy safety-related policies, procedures and practices. One of the requisite pillars for the safety of any modern technological system’s safety today is transparent, total-system-oriented accident and incident investigations, including the reporting of them and unfettered access to them by analysts or any interested party. This pillar is either broken or missing at both Metrolink and MTA. Other serious system-related problems that have plagued our rail safety include the tragically narrow MTA Grade Crossing Policy for Light Rail Transit and the woefully incomplete MTA Grade Crossing Preliminary Hazard Analysis, which has been used in the now-under-construction Exposition light-rail project. If there is a silver lining to the deadly Metrolink crash in Chatsworth last month, it is the heightened attention to rail safety in the country, and especially in Southern California. At the federal level, the House of Representatives passed sweeping rail-safety legislation last week that requires more rest for workers and technology that can stop a train in its tracks if it’s headed for a collision. This rail-safety bill was passed by the Senate this week, and it is expected that President Bush will sign it into law soon. At the state level, last week the Metropolitan Transportation Authority and its board, chaired by Los Angeles Mayor Antonio Villaraigosa, voted unanimously to approve a series of safety directives for Metrolink. And last Friday, the Metrolink board of directors unanimously passed a wide-ranging measure to improve safety that included adding a second engineer to some of its trains, using technologies to slow or stop trains when a warning signal is not heeded, and appointing a panel of experts to recommend safety improvements. These are all good steps. However, it’s unrealistic to hope that by showering our transit-rail-system operators with more cash and throwing high technology at their safety problems, we will be much safer. The lion’s share of the earmarked funds are for new devices that could only slow down or stop a train locally or remotely, as in the case of positive train controls. They would not have any impact whatsoever on the other major causes of deaths on the tracks on our light-rail and high-speed commuter rail systems, which are grade-crossing accidents. What he now recommends concerning the major safety improvements of the MTA and Metrolink rail network in the Southland is precisely what he suggested previously in his report. We are simply asking him to put the money where his mouth is by helping implement his vision. Najmedin Meshkati is a professor at the University of Southern California. He teaches and conducts research on the safety of technological systems and created USC’s Transportation Safety Program in 1992. In the wake of the tragic Chatsworth accident, Southern California’s rail transit agencies have undergone increased scrutiny (for some inexplicable reason, the rail safety oversight body for the state, the California Public Utilities Commission, has been spared). 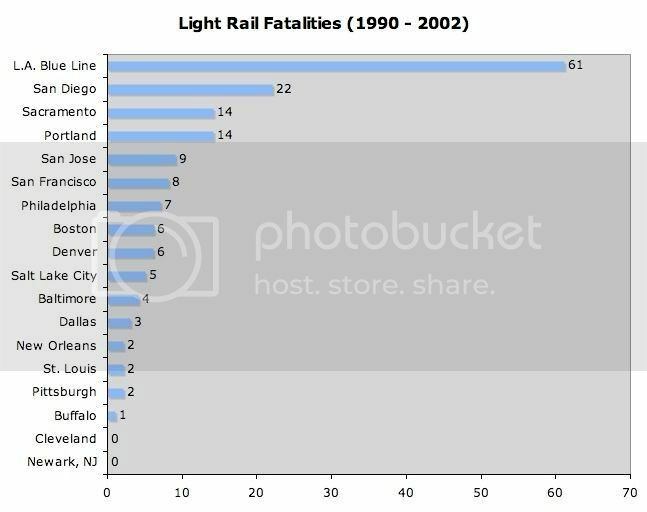 In so many categories, Metrolink (commuter rail) and MTA (light rail) have operated systems that even in comparison to their peers are far more deadly. Are we to believe, for instance, that all crossing incidents were because of negligence when the death rate is so much higher here than almost any other place in the nation? Regarding the Blue Line, MTA and predecessor agencies have spent billions building new rail lines: the Red Line, Green Line, and Pasadena Gold Line and still they haven’t gone back to add grade separation to the black-eye of rail transit safety in the country, which is slicing through South LA, Compton, Watts and Willowbrook killing people (many of them children), on a consistent basis every year. Instead, MTA proposes to replicate the most accident prone sections of the Blue Line in East LA on the Eastside extension and in South LA with the Expo Line. In the $30-40 billion dollar measure put on the ballot by MTA there is not one penny for grade separations on the Blue Line, additional grade separations on Phase 1 of the Expo Line, or Metrolink safety upgrades. The transportation measure that is intended to set the course of the MTA for the next 30 years and there is not one penny to fix the current problems. The reality is the culture of MTA and Metrolink, which are governed by our region’s politicians, does not value lives. Our politicians have falsely translated our region’s desires for traffic relief into a commuter rail and light rail system built on the cheap and unsafely. Join us at our first community update and organizing meeting in the new decade as we discuss the on-going Farmdale controversy and Crenshaw subway effort. 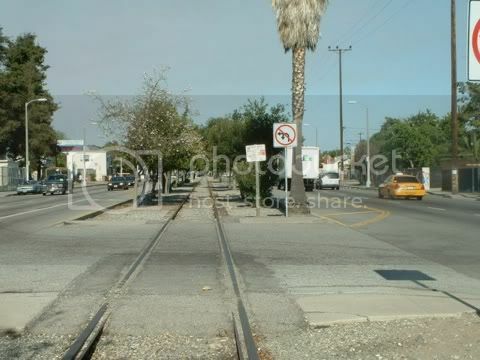 Mayor: South L.A. Not Even 3/5 "Man"
Copyright © 2010 Citizens' Campaign to Fix the Expo Rail Line - "Every grade crossing is an accident waiting to happen" David Solow, Director of Metrolink. Subscribe to our RSS.